In Egypt he was born so long ago. An Israelite, he was the son of a family from the tribe of Levi. Under the looming shadow of Pharaoh he lived, and when he was grown, he made a hasty journey that took him deep into the land of Midian. His destination at last was Mount Horeb, where he would begin a long and amazing adventure that would test his faith and show Him the power of the Deity of his fathers. With a simple wooden staff in hand, he stood boldly before the king of Egypt doing great wonders; making his rod transform into a serpent, turning the Nile to blood, bringing forth a plague of frogs, and even making lice from dust. You may think you know of whom I speak, yet I am not describing Moses, but his brother Aharon! Aharon, the older brother of Moses, had a part to play in the grand Exodus story. He was there for almost every astonishing event recorded for us in the Torah's account of the redemption from Egypt. He was eyewitness to the rescue of the people of Israel from the land of Egypt and the slavery of the Pharaoh. However, next to Moses, his role is greatly diminished. Moses seems to take so much of the center stage in the telling of the events of the Exodus, and there is nothing wrong with that. He was used mightily by the Holy One to lead the sons of Jacob to the Promised Land. Aharon often takes a backseat to his presence. For instance, the Torah records that the Holy One spoke to Moses over one-hundred and fifty (150) different times! Once Moses is introduced in the Torah, it is difficult to go one chapter without reading the phrase that he was addressed personally by the Most High. When it comes to Aharon, although he was chosen to be the high priest of all of Israel, the Torah only records three different situations in which the Holy One spoke directly to him alone. Looking at those three instances can provide an important insight for us. It is not every day that we can say for certain that we have been spoken to specifically by the Creator of all things. Yet, when He does speak, His words are exactly what we need to hear, and we can trust that even if we go seasons of time without hearing Him, He is still using us and has a purpose for us. Although Aharon had been kept for a purpose in Egypt while Moses lived for so long in Midian, the Spirit felt no need to speak to the man until his journey aligned with the purpose of Moses after many long years. The first instance is found in Exodus 4:27. And YHWH said unto Aharon: “Do go to encounter Mosheh [in] the wilderness.” And he went, and met him on the Mountain of Elohim, and kissed him. The text does go on to tell us of the reunion of the two brothers, and then the great events of the Exodus are laid forth before us. We are easily swept up in the grandeur of the account – the glory of the Creator and the terror of the plagues upon Egypt; the hasty flight of an uncertain people into the desert and to the edge of the sea – and beyond. The account is easily romanticized in our minds as we read of the coming to Mount Horeb / Sinai, and the entering into of a Kingdom covenant with the newly-born nation of Israel. The repeated calls of the Most High to Moses to speak His words to the people are seen – the giving of the commandments, the instructions to build the tabernacle and its articles of worship, and the intricate details that make up these interactions. The building of the Tabernacle and the show of glory as He descends to dwell with His people . . . In all of this, it is easy to overlook the fact that Aharon is not addressed directly again by the Most High until much later in the events recorded - well over a year after his initial first calling! Rather, it is in Leviticus 10:8-11, that we encounter for the second time the note that the Holy One spoke specifically to the high priest alone. The context for this direct utterance to Aharon is salient to consider. The Holy One did not speak to Aharon solely after the incident with the golden calf – that shameful event that forever altered the status of the people of Israel before their Deity. Neither did He speak only to the high priest at the raising of the Tabernacle and the dedication of it. The Most High waited for the disobedience of two of Aharon’s sons in offering strange fire of their own accord, and their subsequent death penalty by His own hand before addressing the man directly again – recorded for us in Leviticus 10:1-2. The Holy One had executed the two oldest sons of the high priest without a hint of warning in a blatant show of wrath and fiery punishment, and only after did He choose to speak directly to Aharon. It was not a time for Moses to relay divine information like he sometimes was ordered to do for Aharon. No, this moment in the life of the Levite was of such sorrow and gravity that the Most High knew He must speak straight to the high priest in his time of mourning and confusion. This addressing of Aharon by the Holy One showed him that the calling for which he had been chosen was one of great worth and high personal consequence. Leading the worship for the entire nation of Israel would not be a simple thing to take lightly, but would demand of him and his descendants great personal integrity and respect before the One to whom they offered all prayer and sacrifice. From the context of the proclamation the Creator gave to Aharon in this passage, it appears that his deceased sons had erred in their service by attempting to minister while intoxicated with alcohol. They did not have their wits about them, and leading worship for the nation required sober heart and mind. To stand before the Consuming Fire Himself and offer fire on His altar in worship is an act of respect and union with Him. Misusing that allowance to come near would not be countenanced. Our access to His Presence should never be taken for granted. We approach Him in the way He tells us to, and nothing more or less. Taking great personal care to worship Him appropriately would be a living teaching to the people, showing them the difference between holy and profane, between unclean and clean, to learn about the commands given to them by the Most High. 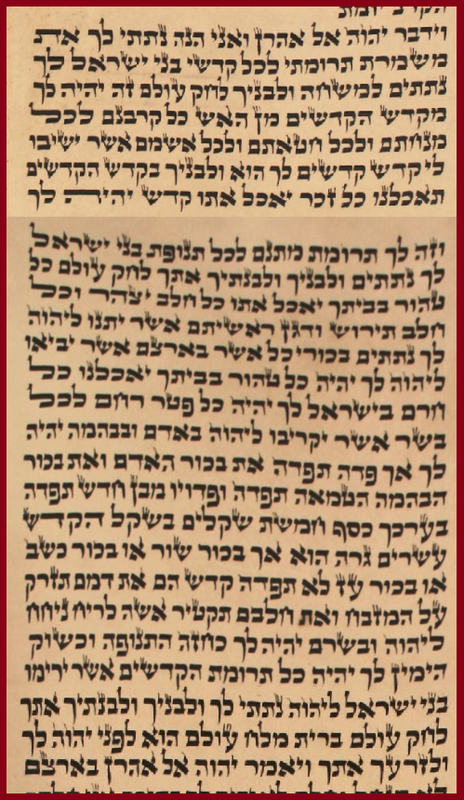 The third and final time that the Torah records the Holy One directly addressing Aharon is found in Numbers 18:1-24. The timing of this event is an unspecified date after the initial reconnoitering of the land of Canaan by the twelve spies, and the subsequent judgment against the people to wander in the wilderness for forty years. Aharon is addressed solely for the last time in the following passages. 1 And YHWH said unto Aharon: “You and your sons, and the house of your father with you shall lift up the wickedness of the Set Apart Place. And you and your sons with you shall lift up the wickedness of your priesthood. 2 And also your brothers of the tribe Leyvee, tribe of your father, bring near with you, and they shall be attached unto you, and they shall minister for you. And you and your sons with you are towards the face of the Tabernacle of Witness. 3 And they shall guard your charge, and the charge of the entire Tabernacle – only concerning the utensils of the Set Apart Place and concerning the altar they do not come near, and they shall not die – neither them or even you. 4 And they shall be attached unto you, and they shall guard the charge of the Tabernacle of Meeting for all the service of the Tabernacle, and a stranger shall not draw near unto you. 5 And you shall guard the charge of the Set Apart Place, and the charge of the altar, and there shall be no further wrath upon the sons of Yisra’El. 6 And see, I have taken your brothers, the Levi’im, from the midst of the sons of Yisra’El; for you they are a gift given for YHWH, to perform the service of the Tabernacle of Meeting. 8 And YHWH spoke unto Aharon: “And I, see, I give to you the charge of the heave offerings for the entire set apart [things] of the sons of Yisra’El. To you I have given them for the anointing, and to your sons, for an ordinance forever. 9 This shall be to you from the most set apart [things], from the fire: all offerings, all grain [offerings], and all sin [offerings], and all trespass [offerings], which they shall return to Me, shall be most set apart for you and for your sons. 10 In the Most Set Apart Place you shall eat it – every male shall eat it; it shall be set apart for you. 11 And this is for you: the heave [offering and] gift, with all the wave [offerings] of the sons of Yisra’El. To you I have given, and to your sons and to your daughters with you, for an ordinance forever: all clean in your house shall eat it. 12 All the fat of the oil, and all the fat of the wine, and the wheat; the firstfruits which they give to YHWH – to you I give. 13 The first-ripe of all which is in the land which they shall bring to YHWH shall be yours. All clean in your house shall eat it. 14 All devoted [things] in Yisra’El shall be yours. 15 Every firstborn of the womb for all flesh, which they bring near to YHWH, in man and in beast, shall be yours. However, you shall certainly redeem the firstling of the man, and the firstling of the unclean beast you shall redeem. 16 And those to be redeemed are redeemed from the son of a month with your assessment, of five silver shekels, with the shekel of the Set Apart Place, which is twenty gerah. 17 However, the firstling of a cow, or the firstling of a sheep, or the firstling of a goat you do not redeem. They are set apart. Their blood you shall sprinkle upon the altar, and their fat you shall burn for a fire offering, for a sweet scent to YHWH. 18 And their flesh shall be yours, as the breast of the wave [offering] and the right shoulder shall be yours. 20 And YHWH said to Aharon: “In their land you shall have no inheritance, and no portion shall be yours among them – I am your portion, and shall be your inheritance in the midst of the sons of Yisra’El. 21 And to the sons of Leyvee, see, I have given every tenth in Yisra’El for an inheritance, in place of their service which they perform – the service of the Tabernacle of Meeting. 22 And the sons of Yisra’El shall not draw near further to the Tabernacle of Meeting, lest their sin be lifted up, to die. It is important to view these lengthy words to Aharon in the context in which they came. Immediately before they were given was the grand contest of who was really chosen to be the leaders of Israel: Moses and Aharon or Korah and his followers. Korah was a relative of Moses and Aharon, and felt his prominence in the family earned him the position of leadership and the right to appoint whom he wished under him, yet such was not bestowed upon him. He ended up inciting a spiritual revolt among two-hundred and fifty leaders of the Israelites, and their rebellion led not only to their miraculous destruction, but also to the undeniable vindication of Aharon’s place as the divinely-chosen worship leader for the Kingdom people. All of these details are recorded in the book of Numbers 16 and 17. The Most High felt it necessary to speak straight to Aharon after the rebellion resulted in the deaths of Korah and his initial family by having the ground open and bury them, also the deaths of the two-hundred and fifty who followed him and offered unsanctioned incense by way of a divine fire that engulfed them in the same manner as Aharon’s two oldest sons, and even a plague that consumed fourteen-thousand and seven hundred subsequent Israelites who were confederate to Korah’s plight. The time was absolutely vital to speak to the brother of Moses, who likely bore a guilt and personal responsibility for all the dead in Israel. The passage is lengthy, yes, but it affirms that the calling given to Aharon was a divinely-established place of authority in the Kingdom. The difficulties he faced by others did not erode the placement he held by the appointment of the Most High. His mission was to minister to all Israel. His purpose was to provide atonement in his intercession. With that function in place, he needed to serve without worry of how he would find provision in life. His inheritance among the tribes would not be lasting physical land, but the inheritance of partaking in the gifts given to the Holy One Himself. Aharon and his sons would find a unique attachment to the Most High in their priesthood: they would share in the offerings of the sons of Israel. In this way, although they had been set apart as different than the other eleven tribes, they would yet find a direct connection to them all, as they received portions of the sacrifices and the bounties of the fields, living out in their own physical bodies a linking tether to the Spirit of the Holy One Himself. Through the presence of the Aharon and his descendants, the people would experience a human channel to the Spirit they worshiped. The third and final time the Holy One is recorded as speaking solely to Aharon, we see the clear and express purpose of the calling of the first high priest of Israel. He did not enjoy the multitude of times that Moses did of exclusive, one-on-one meeting with the Most High. Additionally, Moses and Aharon together were addressed by the Holy One of Israel a total of eighteen times. He himself only had the favor of being spoken to by the Deity of His fathers on just three separate occasions. It may not seem fair, but in those moments recorded for us, we can see how the Most High birthed trust in him, compassion for his loss while at the same time reinforcing the serious role he played among the people, and finally, the explanation of the purpose of his calling as a high priest to be the human link between heaven and earth. Aharon may not have often heard the intimate voice of the Spirit speaking only to him, but it seems that when he did, the Spirit knew exactly when to speak and what to say. In the life of the believer, as individuals in the corporate Kingdom, we do not get to choose when He reveals His mind to us personally, but we can trust that those moments of mercy will be exactly what is needed in our lives to perform His plan, to remind us of the seriousness of what He has called us into, and the promise that He will take care of us in that calling. ​Let us live a life that allows us to listen when we are spoken to.